1. Judd Nelson wears too many coats. 2. The Big Lebowski offers a definitive answer to the question: "Do strong men also cry?" 3. Taxi Driver is probably the best film I've seen over the last year. Birdemic: Shock and Terror is definitely the worst. 4. Eddie Murphy used to be funny. 5. Don't bother watching a movie on a plane if you're a fan of amusing profanities. 6. Dirty Harry is a fine film, but not a patch on McGarnagle. 8. Jude Law's Australian accent is pretty damn shoddy. 9. Watching 16 horror movies is a healthy and productive way of spending your week off work. 10. Hanna was my favourite film of 2011. 11. Margaret just might be my favourite film of 2012. 12. If you want to clear a large group of zombies out of your house, running them over with a lawnmower may be your best option. 13. Homer Goes To College is the most cromulent episode of the Simpsons ever. In other news, I'm really excited about going to see The Cabin in the Woods, but as not too many of my friends are fans of the horror genre, it looks like I'm going to have to wait until next weekend before I get to see it. This wouldn't normally be a problem, but it's a movie which apparently has some major plot twists, so in order for me to go in to the cinema 'fresh', I'm having to be very careful about the articles I read online. Both the BBC and the Guardian have run stories which contain major spoilers to the movie's plot over the course of the last week, and it was only by frantically clicking the 'back' button on my web browser that I was able to avoid having the film's surprises ruined for me. This highly acclaimed movie from Iranian director Abbas Kiarostami sees internationally renowned academic James Miller (William Shimell) in Florence to promote his latest book, in which he argues that copies of artworks have just as much intrinsic value as the originals. After the opening scene, in which Miller gives a speech setting out his arguments, the remainder of the film sees him spend a day out in the Tuscan countryside with Elle (Juliette Binoche), a fan of his work. Or at least, that's what appears to be the case for the first 45 minutes - at this point, things start to get highly confusing, as the relationship between the pair changes abruptly, and almost without warning, from that of a pair of polite strangers to the conversational patterns of a long established married couple. I've never been too great at picking up on the more subtle aspects of filmmaking - generally imagery and metaphors have to be made repeatedly and obviously for me to pick up on them. All the same, if I was to offer my interpretation of what transpires in this movie, I would suggest that in the second half of the picture, the pair are attempting to see if Miller's theory will apply equally to human relationships as it does to art. By acting as a facsimile of a married couple, perhaps the pair can learn something about the value (and also the difficulties) of a long term partnership. After sitting through this movie, I can't honestly say that I enjoyed it all that much - I spent too much time in a state of complete bafflement to completely engage with what was happening on the screen. On the other hand, while I was confused, I was never bored with what I was watching, and both of the lead actors (particularly Binoche) give strong performances in their respective roles. As I've mentioned above, I'm really looking forwards to seeing The Cabin in the Woods, and this is another film which takes a fresh look at the rather tired horror film trope whereby a group of attractive but dimwitted students spend a weekend in the country and end up getting butchered by angry and/ or psychotic rednecks. This is something which I've seen before a number of times - such as in Deliverance, The Hills Have Eyes, The Texas Chainsaw Massacre, any number of Friday the 13th sequels, etc. etc. Anyway, with this movie, the tables have been turned - our protagonists are a pair of humble, likeable hillbillies who decide to spend some time in their holiday home in a dank, gloomy forest. Unbeknownst to them, however, a band of arrogant and foolish college students are also spending their spring break in the woods. 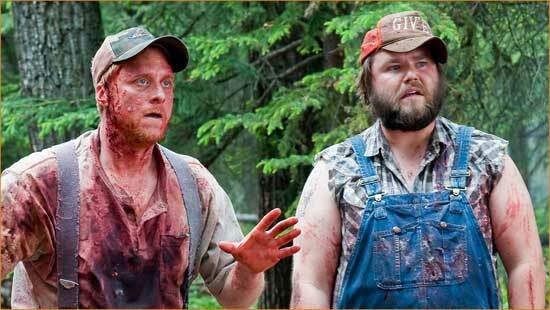 Tucker and Dale have nothing but good intentions towards the college kids, but tragically, their friendly overtures are mistaken for murderous threats, leading to a series of unfortunate accidents, in which the youngsters contrive to find ways to shoot, skewer, burn and otherwise hurt themselves... I have to say that this is a really good idea for a film, but in practice, the results are just fair to middling. For a film billed as a 'horror/ comedy/ romance', it's never very scary, or romantic, and though there are a few funny moments, the humour on offer here is very hit and miss. I suppose that it's difficult to mash together the horrific and the hilarious, though that never stopped Shaun of the Dead (and to a lesser extent, The Cottage) from succeeding.